is designed to reduce back pressure on your system. The brass manifold connects to your pump via a 3/4" barb. The Hakko Air Pump outlet fitting comes with a white L Tube that will connect directly to the 2 way Manifold. The outlets on the manifold are 3/8" barb. Use the 2 Way Heavy Duty Manifold for Hakko Air Pumps HK 25L through HK 80L. 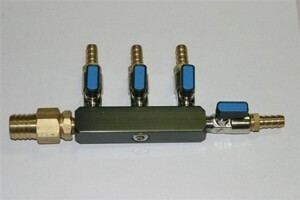 Use the 4 Way Heavy Duty Manifold for Hakko Air Pumps HK100L to HK120L.